In addition to our list of sports medicine services below, we also offer preventative health care, advanced dentistry, and general medicine. tendon and ligament injuries, or any other musculoskeletal disorder. Laser therapy decreases pain, decreases inflammation, and accelerates healing. Contact the Bayhill team to schedule laser therapy for your horse, or click on the link below to find out more about this treatment! Stem cell -Mesenchymal stem derived cells can increase collagen production and help organize the collagen fibers in the ligament. Blood is collected from the horse’s bone marrow and sent to a lab to isolate the stem cell fraction. The cells can be cultured and concentrated to the desired treatment dose. The cells are then returned in approximately 2 weeks and injected into the lesion under ultrasound guidance. Here are two pictures showing the small cannula that is inserted into the horse’s sternum to collect the bone marrow aspirate. This process is done under light sedation and a small local anesthetic block. Currently, horses suffering from chronic pain and lameness must undergo lengthy and cumbersome treatment regimens. These usually involve prolonged medication and surgical interventions. Often the results are not satisfactory. Shockwave therapy constitutes a new modality for dealing with refractory conditions. The Shockwave treatment delivers high-energy focused shockwaves that can reach areas several inches below the patient's skin. Shockwaves are high-energy sound waves, which are transmitted to the effected body part. After a diagnosis is completed by the veterinarian, they determine if the horse is suitable for Shockwave treatment. Treatment requires mild sedation and horse remains standing. Treatment is usually 10-20 minutes. Usually the horse can leave with in 1-2 hours of the treatment and will have resting and follow up requirements discussed. Improvements vary from horse to horse, but generally improvement is achieved within days or weeks depending on condition. Positive results are obtained in cases where conventional methods failed. In some cases, it is necessary to repeat treatment. The Shockwave treatment is recommended for the management of a variety of musculoskeletal disorders that cause chronic pain and lameness in horses. Blood plasma that is enriched with platelets. It contains protein growth factors that initiate wound healing which enhance the access of healthy inflammatory cells to areas of injured tissue. They also help to encourage the formation of new blood vessels and connective tissue. A blood sample taken from horse and immediately processed to separate blood plasma rich in platelets from the red blood cells. This PRP with its associated growth factors is then immediately injected into the soft tissue lesions creating what some call a "super-clot" that serves to help create a biologic scaffold upon which the body's own cells migrate and produce new collagen fibrils along lines of tension in the structure being treated. TILUDRONIC ACID 50 mg/vial (as disodium tiludronate 56.91 mg/vial) also known as TILDREN Injections is a powder and solvent for intravenous injection. Solvent is water for injection. Tiludronic acid belongs to the bisphosphonate therapeutic class, a class of products with activity on bone metabolism. The main pharmacological property of TILDREN lnjection is to reduce bone resorption by inhibiting the activity of osteoclasts. TILDREN lnjection acts as a regulator of bone remodelling in all situations involving excessive bone resorption. This regulator effect is not associated with a negative effect on bone formation or bone mineralisation at the recommended therapeutic dosage. Treatment of lameness associated with bone and cartilage changes such as those observed in Navicular Disease and Bone Spavin.Areas of reduced bone density are a pathological change common to most cases of Navicular Disease and Bone Spavin and are due to inappropriate resorption of bone ("osteolysis"). In double-blind, placebo-controlled clinical trials for both conditions, TILDREN treatment produced clear improvement as demonstrated by longterm reduction in lameness and progressive resumption of sporting activity. In another double-blind, placebo-controlled clinical trial into the treatment of back pain associated with bony lesions of the vertebral column, TILDREN treatment induced a clear improvement in back flexibility, however further research is required to add this indication as a registered claim. Other studies have shown that TILDREN treatment can prevent the bone loss which usually occurs during inactivity in horses, as shown by measurements of bone density in spelling horses. TILDREN lnjection has also demonstrated anti-arthritic properties in a model of poly-arthritis in rats. In vitro data identified inhibiting effects on the secretion of enzymes which degrade cartilage matrix. IRAP (Interleukin-1 Receptor Antagonist Protein) is an effective intra-articular treatment for joint disease. It is designed to stimulate the horses' own white blood cells to produce anti-inflammatory mediators and enzymes that can reduce the inflammation present as a result of degenerative joint disease. Blood is collected into a syringe containing specially treated Chromium glass beads. During a 24-hour incubation period, the red blood cells interact with the bead's surface stimulating the production of large quantities of IRAP and other anti-inflammatory proteins and growth factors. The blood is then placed in a high-speed centrifuge to separate out the resulting serum, which can be injected into a problem joint, or frozen for future use. Equine thermal imaging can graphically map skin surface temperatures in response to changes in blood flow. It can be used to determine if there is inflammation in an area that was sore on palpation, or to detect an area of increased blood flow when there is no specific pain or signs (subclinical inflammation). When combined with a thorough clinical examination it is extremely useful in identifying soft tissue injuries that may have otherwise gone undetected. We all know that saddles are an expensive investment. Whether you’re purchasing a new saddle or assessing a current saddle, thermal imaging is a safe, non-invasive technique that can offer peace of mind in your horses’ comfort level! Bayhill has one of the most sensitive thermal cameras available! Call us at (650) 851-2300 to learn more or schedule a thermal imaging clinic at your barn! Chiropractic care focuses on identifying and adjusting biomechanical dysfunctions in the skeleton that can have adverse effects on the nervous system. Although chiropractic care does not replace traditional veterinary medicine, it can work in conjunction with traditional methods to optimize performance and serve as an additional tool for the identification, treatment and prevention of musculoskeletal disorders. Although acupuncture originally started in traditional Chinese medicine as a way to optimize energy flow, or Chi, throughout the body, medical research has demonstrated that it has direct effects on the nervous, immune and endocrine systems. By directly stimulating nerves and related tissues, acupuncture can help to increase blood flow and directly modulate nerve function to help reduce pain, treat muscles spasms, and aid in internal organ function. 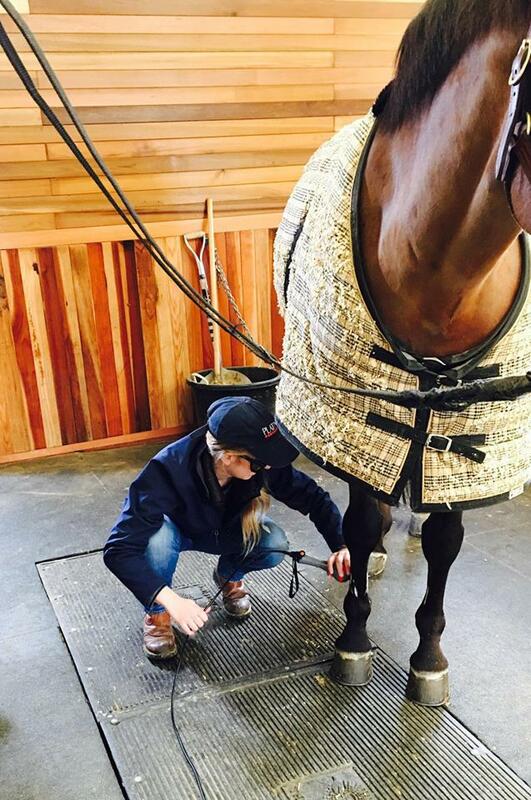 Although not a replacement for traditional veterinary medicine, acupuncture can serve as a complementary practice to help identify and treat a multitude of problems in addition to maintenance of performance horses.